with his headphones brand V-Moda. He has lined up it up with exceptionally fashionable and capable headphones that stand out from the crowd. They are works of beauty with substance. Kolton, a professional DJ and producer himself, has made no compromises with the audio, although the cans are geared more towards DJs and casual listeners than critical listeners. In this post we cover the best V-Moda headphones ranked in the order of their performance and a variety of other factors. If you have your heart set on this brand, this post should help you make the decision. How are V-Moda headphones different? 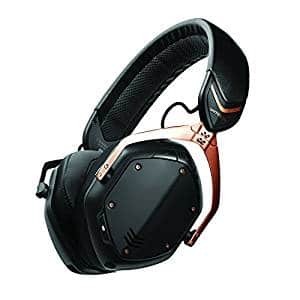 V-Moda headphone line-up was founded with a specific focus. These are portable headphones for casual listeners and DJs with a very well-implemented V-shape sound signature. Most of their headphones over-ear, on-ear and in-ear, are compressed in the $100-$300 price range. 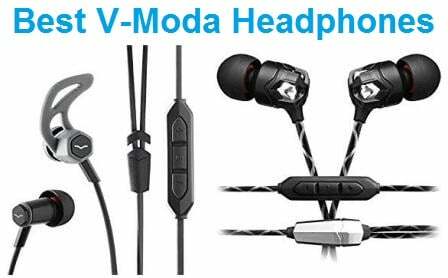 All their headphones have a distinctive design that clearly labels them as V-Moda property. 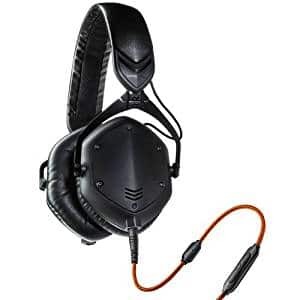 So how does V-Moda compare to headphones from other brands? r own team logos or designs. The general theme of the headphones is a bold grungy metal design, although they do have the subtle Rose Gold variants as well. The in-ear headphones or earbuds also reflect a bold and strong design style. Build Quality They look great, but can they stand the abuse of regular use? Yes they can. And this is truer of V-Moda more than any other headphone brand. They headphones are tested by military standards of durability. They use mostly premium materials in their designs. The frame is typically made of metal and high-impact plastic. This ensures that the headphones can take a beating without damage. In spite of the generous metal structure, the headphones are very flexible. The contortionist headbands can twist in different ways without damage. The quality standards are maintained everywhere. The cables are woven in Kevlar for extra strength. The headphones are also immune to natural elements like heat, salt spray and UV rays. V-Moda also extends good warranty terms just in case you damage the headphones. Accessories Since V-Moda headphones are designed to be highly portable. So they are accompanied by a wholesome bunch of accessories with many more optional accessories available online. The most prominent of these is the exoskeleton case with hugs the headphones snugly, in their folded or unfolded form, and keeps them safe against damage from banging around. Then there’s the SpeakEasy cable with a single-button inline control and mic. There are more options of cables like one that can share music with another headphone. You also get the BoomPro mic which can be attached to their headphones for gaming or Skyping. Audio Quality Rich, V-shaped sound signature is V-Moda’s style. Although they have an M-series with “Monitoring headphones, these are more suitable for DJ monitoring than reference monitoring. The sound signature has a calculated bass boost that lends body and depth to bass. They do not compromise on bass definition just to boost bass. It’s not just the quantity of bass, the quality of bass is also quite polished in V-Moda. When compared to neutral headphones, you might notice the slightly recessed mids in V-Moda. But Sennheisers are majorly meant for critical listening and for the folks who like the neutral sound signature. d by bass-forward earbuds to expect more body in their audio which V-Moda serves up in satisfying amounts. 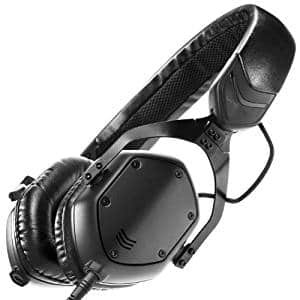 Hip Hop, Techno, EDM and such genres generally benefit from the V-shaped response of V-Moda. Their headphones exhibit above average detailing and audio balance. Features Most V-Moda headphones have detachable cables. They have some wireless options too. We are yet to see a Noise-cancelling headphone from this brand. Many headphones are foldable too although that feature disappears in the more affordable headphones in the lineup. Price Like we said, the V-Moda headphones all lie within a very small price range. So we don’t have many options in the budget category. Given their extra cautious build, they do seem more expensive to the audiophile who can do without the military-grade features. Brands like Sennheiser and Sony have more headphones in the brand which are more neutral and hence can be Equalized better. The difference is V-Moda provides the required signature to a certain demographic with no EQ needed. Special features V-Moda is yet to come up with a noise-cancelling headphone. Their wireless headphones do not provide a companion mobile app to control the features remotely. We are nitpicking but for the same price, other brands are offering this facility. 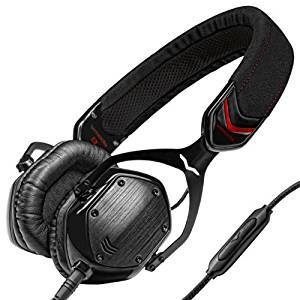 Which are the best V-Moda headphones? aries in the amount the refinement they can bring to this sound. Surprisingly, it’s their latest wireless headphone that achieves the best balance a full and rich sound and neutrality. Comfort Comfort tests were done on the headphones right out of the box. Some of them required a change of earpads for better comfort. Some stayed snug and fit right out of the box. We also compared between the comfort levels of over-ears and on-ears. Features We checked that the headphones backed up their performance with user-friendly features in comparison to their competition in the market. Foldability, Bluetooth connectivity, detachable cable were some of the features that gained brownie points. Price We ranked the headphones that offered great value for money near the top. Headphones from different price ranges were compared on this basis. Whatever your budget be, we want you to get the best for your money. transforms them from their raw and grungy to elegant and suave without altering the DNA, there have been many under-the-hood changes. V-Moda perfects their trademark sound signature in this wireless version of headphones. Their versatile performance earns them the top spot on our best V-Moda headphones list. The V-Moda Crossfade2 wireless headphones seem much like the M100 headphones. Upon closer inspection, you see the small tweaks that make the Crossfade2 seem more graceful and elegant. In their black/rose gold version they have done away with the brushed metal backplates, instead they go for a matte black backplate. The screws still stand out boldly in Rose Gold. The designers chose a graceful interplay of the contrasting colors, so that it’s never too flashy. The earcups are hexagonal like all other V-Moda headphones and are connected by the highly flexible headband. The frame is made of steel including the yoke. The biggest upgrade from the previous headphones is the earpads. Some users of the previous V-Moda headphones have complained about the shallow and small earpads which may form pressure points on large ears. The work-around is that most people replace them with XL-sized earpads. In Crossfade2 wireless headphones, they have used earpads larger than that of the M100 but not as large as the XL pads. They are comfortable and deep without feeling like they’ll smother the ears too much. The headband can be twisted every which way without damage. They weigh 10.9 ounces which is slightly heavy for smaller heads. But they stay comfortable thanks to the cushy pads. These V-Moda headphones are built for military standard durability. The earpads are sheathed in vegan leather, a small but important detail. The design is durable against the natural elements like temperature, humidity, salt spray and UV rays. They also try to minimize the gap between the headband and the head so that they look snug and fitting. The headphones are foldable. The arms turn inwards at a hinge to reduce to a compact package that fits inside the hard exoskeleton case. The carry case fits snug and is solid and can be attached outside your bag since it’s durable and protects the headphones completely. The Crossfade 2 wireless headphones connect wirelessly via Bluetooth to playback sources within a 33 feet range. This is multipoint Bluetooth, so they can connect to two devices and play audio based on priority. The Rose Gold model is equipped with AptX support which enhances the quality of Bluetooth playback with sources that support AptX. The battery life on Bluetooth is 14 hours, which is only average for the price range. When they run out of juice, they can be used in a wired manner with the accompanying cable. This is the same cable that V-Moda ships with their wired headphones too. It can withstand up to 1 million+ cable/plug bends and terminates in a 45-degree plug which combines the best of straight and 90-degree plugs. These have a single mic for making phone calls and the call quality was very good when we tested them. They also have a quick charge option which lends them 3 hours of battery life with just a 30 min charge. As with all V-Moda headphones, you can replace the backplate with laser-engraved plates using the optional custom shield kit. These headphones are available in white, black and black/rose gold colors. Both physically and sonically, the Crossfade 2 wireless are a jack of many trades but master of none. Which is a boon, since they tend to be so versatile for different target audiences and purpose. Upon fitting them on your noggin, you immediately notice the noise isolation. These can close out much of the lower frequency ambient noises with just the passive noise cancelling. Do note that these are not Active Noise Cancelling headphones. Being DJ headphones, these cans recreate a club music-like sound signature. They have just a hint of that extra bass that keeps them from being reference quality. In the Crossfade 2, V-Moda has sculpted down the bass to a much more subtle scale so the audio sounds more balanced. They might even warm the hearts of the occasional audiophile. The bass experience is defined and punchy. The mid-bass bump lends more energy to the bass which flatters genres like EDM. It also makes these V-Modas sound more dynamic and lively compared to similarly priced Bose QuietComfort. The treble is similarly emphasized for sparkle but not to the extent bass is. It has a bit of bite which never converts to sibilance but makes the audio brighter and more exuberant. Between these two the midrange sounds recessed but only slightly. The difference from the earlier headphones is that the mids exhibit better detailing and sound more open. There’s a sense of balance in spite of V-Moda’s bass-first tradition. The wired mode sounds slightly better than the wireless mode. But the wireless performance is one of the best in this price range. being one better. In their wired mode they surpass even the M100 in clarity and tuning. The wireless mode is no less prodigious. The typical V-Moda features are a great addition anyway. We plunged right into their performance and found them worthy of the best V-Moda headphone list. 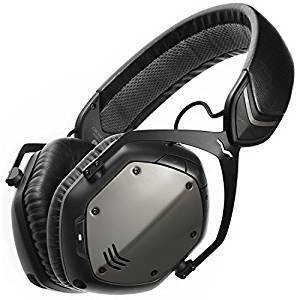 The V-Moda Crossfade look like the M100 on the surface. But there are under-the-hood changes that rake up the weight to 292 grams. This includes the non-user-replaceable battery added to the earcup. The rest of weight, as usual, can be credited to the metal frame that makes V-Moda headphones so durable. The structure has been tested by strict military standards of survival. So they are perfect for portable use and DJs who tend to go tribal on their headphones. These headphones do not fold up like the M100 but the earcups do fold flat. The Crossfade wireless have the familiar diamond-shaped earcups. These are mounted with cushy pads that are supremely comfortable for small and medium ears. However, they will press down on the corners of the larger ears and they aren’t very deep either. V-Moda offers XL earpads that can replace them and offer better comfort. The earcups hang on metal yokes that let them adapt to the shape of the head. Like other models, the aluminum earcup shield are removable and can be exchanged for custom laser-engraved shields from V-Moda. These connect to the source via Bluetooth within 33 meters. They offer improved connectivity courtesy their optimized antenna. They boast of a 12-hour battery life which is decent for this price range. They can also work in the wired mode when the battery runs out. Connecting the headphones automatically powers the headphones off and saves power. They are accompanied by a Kevlar-reinforced 3.5mm male-male cable for the wired mode. They are available in some fancy colors compared to the other models as well. These include gunmetal black, phantom chrome, rouge and white/silver. As usual, an exoskeleton case is included with the pack. However, this one is larger than the hard case of the M100 because the Crossfade Wireless don’t fold up. The V-Moda Crossfade wireless headphones impressed us outright with their Bluetooth performance. We didn’t experience any dropouts or static. It got to work just like a wired headphone. And like wired cans, they also played detailed and engaging audio. The signature is V-shaped much like the M100. But the Crossfade wireless have been tuned better so they sound a tad more neutral. The midrange is very clear in spite of the signature shape and sounds very natural, a characteristic unlike of any bass-forward headphone. In Bluetooth mode, the bass had plenty of punch and power. It extends well, bringing both quality and quantity into the mix. The midrange draws body and richness from the bass. The mids sound substantial while also maintaining their clarity and detail. The treble is sparkly and detailed. It keeps all harshness at bay and plays along smoothly with every genre and recording quality. These wireless headphones make the audio general easy on the ears. The wired mode differs only slightly but it’s more dynamic and tuned better than the M100. This difference between the wired and wireless modes is evident only in a few songs. spot. These have a highly energetic sound with solid bass playback. The design is classic V-Moda with that tough look with some elegant touches. The rugged design and the fun, lively audio earn them the top honors on the best V-Moda headphones list. The V-Moda M100 headphones made a big splash as a style statement. At the time of their debut, they immediately gained popularity for their distinctive style and pleasant sound. Their shadow color scheme looks industrial but with panache. The frame is made out steel with plastic bits. It rakes up a weight of 281g which is slightly higher than average for the over-ear category. However, the weight is offset by soft earpads and a balanced clamp. That being said, these headphones are heavy and need to be given a rest every couple of hours. The earcups of these headphones are hexagonal. They have replaceable backplates made from aircraft grade lightweight metal screwed on to their back. These shield can be swapped with custom laser-engraved shields from an optional kit. The flexibility of the SteelFlex headband is displayed in the fact that you can unfold it completely flat over 10 times without damage. The earcups are mounted on the CliqFold hinges. These metal hinges fold to reduce the size of the headphones to almost half. This makes the compact enough to fit into the snug exoskeleton case with a strap to keep them stable. It has a carabiner clip to hang these off your luggage but the headphones aren’t small enough to carry on your person. The M100s are initially a little tight on your head. Over the time, the grip loosens a bit. Because of their tight fitment, their weight sits well on the head. The earpads feel plush only to small and medium ears. They are a tad small for large ears and apply pressure on the perimeter of the ears. They also feel a bit shallow. Fortunately, the earpads are replaceable and can be swapped for the XL pads available separately. These V-Moda headphones come with a 4.33-foot Kevlar-woven cable. This sturdy yet flexible cable ends in 3.5mm plugs on either side with a one-button control in between. There’s also SharePlay cable to share music with another headphones. They also offer optional accessories like cable with a 3-button control, BoomPro mic and CoilPro coiled playback for DJing. The headphones are tested against the MIL-STD-810G military standards. They can stand 70+ drops on concrete floors from a 6 feet height. These are available in black/silver, matte black, shadow and white silver color schemes. The M100 headphones hit a peculiar balance that appeals to both audiophiles and the bass-lovers. This a combination of warm and dynamic bass and maximum achievable clarity in a bass-forward signature. So even though they clearly flaunt the bass rules of being a premium headphone, they compensate with a rich and engaging bass. Purist audiophiles will obviously find the bass boomy since there’s a clear bass bump. V-Moda walks the talk with its bass. The lower registers are lush and extend deep into the subbass region. The bass is defined and detailed so in spite of the bass boost they don’t feel out of sync. Compared to the slightly expensive Sennheiser Momentum 2 headphones, these have a warmer and more decadent bass. However, Sennheiser, being an audiophile dream, goes for midrange clarity and detailing. The treble is tuned down a bit in M100 because the focus on the bass more. The Momentums have better treble detail and clarity. These help them sound clearer and more open. The strength of M100 is that present deep and satisfying bass without handicapping the midrange and treble like in most bass-forward headphones. The stereo image is spread over a wide soundstage. They sound more open than a regular closed-back headphone. design but never stick out from the head. They are also unique in their audio capability to play a wide and open sound. They are a great portable accessory, both in terms of fashion and performance. They beat a bunch of high performing cans for this spot on the best V-Moda headphones list. The V-Moda XS headphones embrace the newer aesthetics of V-Moda. They have the same hexagonal earcups and durability, but the curves are more subtle and the color more dignified. They will still stand apart from the crowd of headphones at this price. At 195g, these are much lighter than the M100. The frame is still made of steel and connected with plastic. They are available in matte black or silver color choices. The earcups are moderately-sized and sit on the ears, not around them. The back plates can be removed and replaced with customized shields. V-Moda provides these custom kits with the option to laser-engrave a logo or design of your choice. You only need to upload them online and pay for the kit separately. They are mounted of metal yokes where the earcups have some lateral range to move forward and hug the ears. They are connected by a steel headband which can be twisted any which way without damage. The earcups are mounted with plush memory foam earpads that adapt to your ears. These can be replaced for XL earpads if you need them. The XS V-Moda headphones have a detachable cable. This super-strong cord is woven in Kevlar and ends in a 45-degree plug. Jacks on both sides are 3.5mm. So an alternate cable can be easily used. It has an inline mic and single button for play/call control. The other accessories like the BoomPro Mic, 3-button control cable and CoilPro are also compatible with the XS. They also come with an exoskeleton case with a V-Strap that keeps them stable during movement. The arms of the headphones fold and compress into a portable package. Both the ear pieces have 3.5mm slots so one can be used to share music with another headphone. The profile of these headphones is very interesting. They are sleek but they also try to close the gap between the headband and the head. This way they sit very low-profile on the head. The V-Moda XS headphones sound extremely dynamic and lively for the size. They may not have the soundstage of the M100s, but they have a wide frequency response. Their performance ranges from 5-30,000Hz which indicates nice extension on both sides. Bass is in the spotlight of focus in the sound signature. It has a bit of a boost in the mid-bass area, but it does not overwhelm the other areas. It has nice depth and definition. The extra punch really helps since these are on-ears and do not have significant noise isolation. These V-Moda headphones midrange shines with the extra depth of bass. It sounds rich and lush. The mids aren’t as transparent as the reference headphones but for the casual listener they sound quite good. There’s a decent amount of detailing in the mids which lends more clarity to the sound. The treble is smooth and sparkly but not as sparkly as that of M100. The V-Moda XS sounds a tad brighter and more energetic. While the M100 are a little more laidback. reviews faded in to the background when M100 debuted. But the M80 are the more neutral and fundamental model over which the M100 are based. The M80 is an on-ear design that wows with the tight control and balance of its sound signature. These take a well-deserved place in the best V-Moda headphones list. The V-Moda Crossfade M80 look like a smaller, sleeker version of the M100. That’s hardly surprising since all headphones follow a common design. Since these are on-ear headphones, the earcups are significantly smaller. They have the hexagonal design with metal backplates attached via screws. Through an optional kit, you can get these backplates in a different color or upload your design online which V-Moda will custom-engrave on to it. In the Shadow version, the brushed metal backplates stand out against the glossy black rims of the earcups. The headphones weigh 195g, significantly lower than the M100. The frame of these headphones is made of steel and finished in plastic in places. This includes the Steelflex headband which can flattened up to over 10 times without damage. We are unlikely to try that even once, but it’s good to know that the headband is that flexible. The earcups hang off a metal bracket. They can move forward on this yoke to hug your ears. The plush earpads are made of memory foam. Since these are meant to be on-ear headphones, you can expect them to sit on the ears not around them. These pads and the headband are sheathed in vegan leather. The underside of the headband has mesh for better breathability. While these headphones do not fold, they fit into the compact hard exoskeleton case which occupies lesser area. They are also accompanied by a carabiner clip which can be used to hang the case on your luggage. This has an inbuilt strap that holds the headphones down when they are in cover. These headphones have a detachable cable reinforced with Kevlar cables. The cord can bear up to 1 million bends for cables and degree strain relief. The source end of the cord terminates in a 45-degree plug which relieves strain. The headphones can put up with salt spray, humidity, UV rays and temperatures. They can also survive up to 60 drops on concrete floor, that’s a measure of how durable it is. The optional V Moda accessories also fit in with these headphones. The V-Moda M80 headphones have a more balanced and neutral sound signature compared to the M100. The sound signature is still V-shaped with some bass emphasis. The bass is punchy and extends deep into the sub bass range. The lower registers carry their body well and move fast to deal with the rhythm changes in complicated songs. The bass doesn’t muddy the mids significantly, which is why they sound so balanced. We cannot expect reference quality sound from V-Moda, but this is as close as it gets. The midrange is emphasized in the lower mids which lends substantial body to the mids. This sounds warm and engaging. They might not be as transparent Sony MDR V6 but it’s meant for pleasant and enjoyable listen. Since these are on-ears, the image is slightly smaller than the M100. The treble is crisp and has some sparkle. They strike balance between detailing and smoothness so bad recordings are glossed over. They hit with good dynamic impact. The soundstage is impressive for their size. The instrument imaging is little crowded because of the size of the earcups. this line one of the most sought after for the bass-lovers. It also helps that they have the perfect design to go with the club groove. These are the older V-Moda headphones that rock the industrial design boldly. These take one of the top spots on the best V-Moda headphones list. The V-Moda Crossfade LP2 headphones look exactly like the M100. The size and shape of the earcups, the headband and the whole deal. At 260g, the LP2 are slightly lighter than the M100. But they share the same frame of steel and plastic. The headband is made of lightweight and flexible steel. It can be flattened over 10+ times without damage. The headphones themselves can survive over 60 drops on concrete from about 1.5m height. These are also immune to salt spray, humidity, UV rays and temperature gradients. These V-Moda headphones have the trademark diamond-shaped earcups. They swing on a metal yoke which allows them to fit closely on the ears. The earcups are moderately-sized and mounted with memory-foam earpads. For very large ears, these are uncomfortable but fortunately can switched out for the V-Moda XL pads. For medium ears, these can cover the ears completely but may need to be taken off after 2-3 hours. The headband has a mesh layer underneath that helps it vent the extra heat out. As usual, the shields on the earcups are removable and can be swapped for one of the custom-engraved shields that the company will make for some extra price. The LP2 headphones have detachable cables for the go. One of these is a straight audio cable and the other has a single-button inline control and mic. Both are easily replaceable 3.5mm male-male cables. However, you wouldn’t want to, since these low-noise, Kevlar-reinforced cords. An exoskeleton case accompanies these headphones. Although, they don’t fold, these save space by hugging the headphones tight. The Crossfade LP2 are exclusively made for the basshead. Their sound response is dominated by bass but not in a reckless and unpleasant manner. These are quality bass headphones which plays with definition and extensions. The best part about their bass boost is that it doesn’t sound unnatural or boisterous. They still maintain a balance across the spectrum. They have all the bass we want without over exaggerating the effect. These are best suited for Techno, Dance Music and the like. The midrange sounds a tad recessed because of the bass boost. This will irk the audiophiles but the average Joes and bassheads are unlikely to notice. The highs are smooth, sparkly and extended. Another one of the best traits of these V-Moda headphones is their expansive soundstage. The sound image is projected on an impressive soundstage with great width and depth for a closed-back headphones. The noise isolation is good and they don’t particularly leak audio. Their volume can be boosted pretty high without inviting any distortion. on-ears. These are exceptionally capable sport earphones and deliver high-quality audio at a reasonable price. The design is well-thought and the utility features are user-friendly. What more can you ask of one of the best V-Moda headphones. Since the Forza Metallo are neckband style headphones, they have a flexible neckband where most of the circuitry lies. This is designed to stay behind the neck and not slip past the shoulder blades. These connect to wires that leas up to the ear pieces. En route these wires are headphones controls. One side has a 3-button control with play/pause/call/answer multifunctional button and volume navigators. The other side has the power and Bluetooth connectivity button. If the ear pieces are not inserted in your ears, it’s easy to forget that you have these headphones on. As with other V-Moda headphones, these in-ears have significant metal contribution in their build. The earpieces housings are made of aircraft-grade metal. They come with 4 sizes of silicone tips and 3 sizes of detachable sport fins. These are loop that hold the earpieces steady on the ears when you work out or jog. 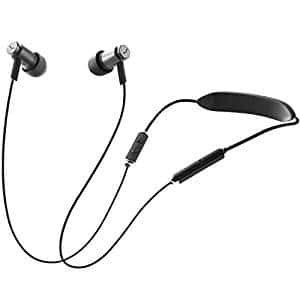 Since these are sport headphones, they are nanocoated for sweat and water resistance. The design is durable as it is elegant. In its trademark style, V-Moda offers design customization in the form of handcrafted caps for the driver housings. These in-ears can last through 10+ hours on a single battery charge. They also have the FastCharge option where they get 2+ hours of playback out of 15 hours of charge. They support AptX for high quality audio playback. They come with a Milano carry case and the accessories for proper fitment and customization. The Forza Metallo V-Moda headphones are more like full-sized headphones in their audio presentation than in-ears. They have a suspiciously spacious soundstage which made us wonder what audio voodoo was happening behind the scenes. The sound signature is closer to neutral than most V-Moda headphones. In fact, the most notable area is the upper mids and the highs where these show remarkable clarity. The bass plays with gusto, given these are V-Moda. It’s punchy, tight and plays very coherently with the mids and treble. These are a pleasant listen. nearly-indestructible and highly portable IEM, one that’s deserving of the best V-Moda headphones list. The metal and Kevlar-structure makes an appearance here as well. The great haul of accessories make them worth every penny of their price. The V-Moda Zn headphones manage to carry the same grungy look that’s characteristic of their full-sized cans. They carry 8mm drivers housed in their Zn casing made by a patented process. The metal shines through a cage-like structure in a stylish design. The eartips protrude straight from the driver casing making them less tricky to wear than tilted eartips. The ear pieces are connected to tangle-free diamondback cable. The cord is Kevlar-reinforced and ends in a 45-degree bent jack which works in the favor of strain relief. There are two different models available of the buy one with a 3-button inline control for Apple devices or the other with a single-button inline control for Android. The entire structure is checked by military standards of durability. All the joints are cemented by Zinc alloy. These earphones come with 8 different sets of eartips, one of which is bound to fit you. They also supply removable earhooks to wear for stability while you work out. A handy case is also included. In spite of being pint-sized in front of the M100, the Zn headphones deliver big sound. They sound lively and vibrant with a warm and natural sound signature. The warmth dulls the edge of lossy and overly bright recordings. The audio is more laidback and less fatiguing for continuous listening. The bass is big and punchy. It does not dominate the audio though. The soundstage is wide and spacious. These aren’t the most revealing earphones, but they flatter all music and every genre. rigors of an active lifestyle. The bass is boosted to drown out the noise of the other gymbodies. That being said, they maintain the balance which leads them straight to the best V-Moda headphones list. The V-Moda Forza in-ear headphones are made for the gym folks and it shows. Done in solid colors, they have options in both vibrant and dull hues. The design is lightweight but sturdy in most parts. The ear pieces look simple on the outside but there’s significant engineering on the hood to ensure that they don’t break easily. These earphones are resistant to sweat and salt spray. The eartips project straight from the ear pieces. These come with detachable earfins to keep the buds in place during workout. One of the three supplied sizes should fit you. There are two buying options in terms of the cable type one with a 3-button Apple-compatible control or the other with a single button control that works with all devices. The weakest link in the design if their 3.5mm jack which needs some strain relief. These come with 4 different sizes of ear tips, a pair of ear hooks and a ventilated pouch to keep them all. The earbuds can be customized in typical V-Moda fashion with laser-engraved driver housing covers. Being workout earphones, the Forza deliver excellent bass. It’s deep, punchy and boosted in a calculated manner. In spite of the boost, they don’t distort at high volumes. But at low volumes, they lend substance to the audio so that the sound is not drowned out by the ambient noise. The midrange gets plenty of attention here as well. The vocals are warm and clear. The bass boost never sends the audio into a bassy wreck. They are quite clear in their presentation. The bass lends substantial body to the audio without tainting the audio. The treble is crisp and lively. genres like EDM, Techno and Hip Hop. The general design of the headphones also fits in with the image of a standard bass-lover. These specialized headphones find a special place in the best V-Moda headphones list. The V-Moda Crossfade LP carries some experimental variations of the grungy M100 design. The frame is still made of metal and the earcups are also hexagonal. But the metal highlights are available in different hues and textures including a snakeskin red and a stark silver. 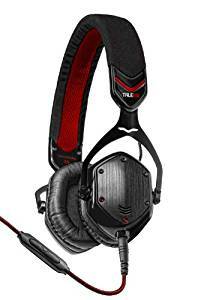 The earcups are mounted with soft memory foam earpads and sheathed in leather. The pads are large and deep enough for the large ears. The headband is broad and sheathed on the underside with ventilated mesh. Unlike M100, these don’t fold inwards. These V-Moda headphones have detachable cables. They come with two cables one with a 3-button control and another is a straight audio cable. These terminates in a 45-degree jack. The cords are Kevlar-reinforced for durability. An exoskeleton case included for carrying them around. They are also compatible with the BoomPro mic which is available separately. As always, V-Moda has tested them by military standards of durability and are immune to environmental elements. The Crossfade LP V-Moda headphones are exclusively designed for the most bass-lovers. There’s a clear focus on bass which lends solid punch to the Dance and Club music. The audio sounds airy and has a bit of echo which emulates the club atmosphere. This may not work well with classical or soft rock. But it works wonders for club music. The soundstage is pretty big for a closed-back headphone. The midrange is clear and natural, and not particularly muddied by the bass. The treble is not as bold as the bass. It is smoothened to reduce the harshness. any compromise with durability. They are a clear upgrade over the stock earbuds with a clear and detailed audio. 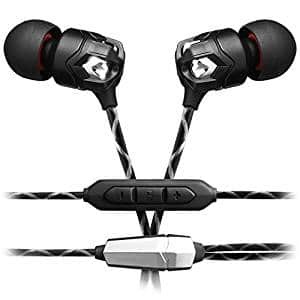 They are a steal for their original price and last much longer the earbuds in the same price range. They get a hot spot on the best V-Moda headphones list. The V-Moda Remix Remote headphones are a masterpiece in metal. The earpieces, the Y-joint and the control housing are all made of lightweight metal. This way, they are immune to everyday physical stress. Like with all their headphones, style is not compromised for durability. The driver housing has a vented rear V- Moda nicely works a pattern. The eartips projects straight from the ear pieces. The cable of these in-ear V-Moda headphones is wrapped in Kevlar fiber and reinforced for durability. It has an inline control with 3 buttons and a mic. It terminates in a 45-degree bent jack housing for the 3.5mm plug. They come with 4 sizes of eartips, a pair of sports earhooks for stable fitment and cloth pouch for portability. The V-Moda Remix Remote headphones wowed us with their clarity and poise. Their price has no bearing on the classic V-Moda performance. They sound detailed and punchy. They isolate well with the right eartips, so the audio ends up sounding more substantial and full. They go for a neutral and natural presentation. Bass is not over-emphasized here. The quality and speed of the bass is much better than the stock earbuds. The mids are clear and put out decent detailing. headphones that beat the familiar path of clear and punchy sound. While it doesn’t get a lot of airspace, these share a lot of the qualities of the M100. They make an excellent close to the Best V-Moda headphones list. The V-Moda V80 headphones sport a metal frame that strengthens their core. They hexagonal earcups are mounted on metal yokes and can swing forward to hug your ears. The earcups are supra-aural so they sit on the ears rather than around them. The memory foam padding helps make this experience easier on the ears. The headband is wide and distributes the weight evenly. It has a mesh underside for better breathability. The cable of these V-Moda headphones is detachable. It is a Kevlar-reinforced cable which is also tangle-resistant. It has a single inline control that can be used with both Apple and Android devices. The back of the earcups have a brushed metal texture which emphasizes the urban industrial look of these headphones. These come with their own exoskeleton case that is quite compact and portable given the small size of the headphones themselves. The V-Moda V80 headphone is a jack of all trades. It plays every genre convincingly well but it masters none. This quality is really useful for music listeners with eclectic tastes. The bass is punchy and clear. It is not over-emphasized but there’s a definite mid-bass boost which adds body to the sound. It’s much needed too in an on-ear headphones which lets ambient noise in. Vocal and treble are clean. We wonder if they deserve their high price tag now that there are much better headphones in the same price range.